When I was very young, I fancied owning a pedal car. That dream is only a distant memory from a dusty folder at the back of my mental filing cabinet. But I recall thinking about it and concluding that my parents would never buy me one. A pedal car was too big and important an object, and I was probably too tall for one anyway. Even back then, I had an instinctive insight into just how far my parents indulgence would stretch, so I never asked for one. Perhaps that early unfulfilled longing has inspired my attraction to toylike cars (like the blue convertible Mini-cooper, black Citroen Pluriel and the red and white Fiat 500 I covet and the fat fendered pseudo-retro third hand PT Cruiser I ended up with). 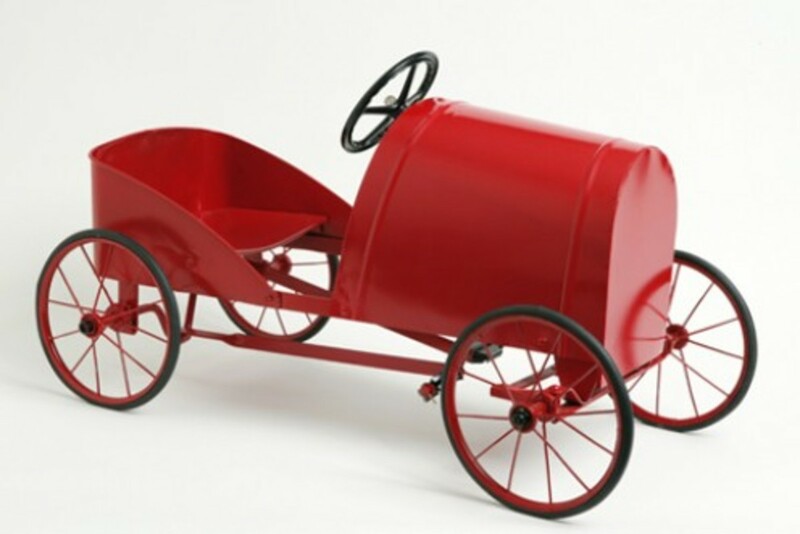 Mini automobiles have been around almost as long as the real thing. 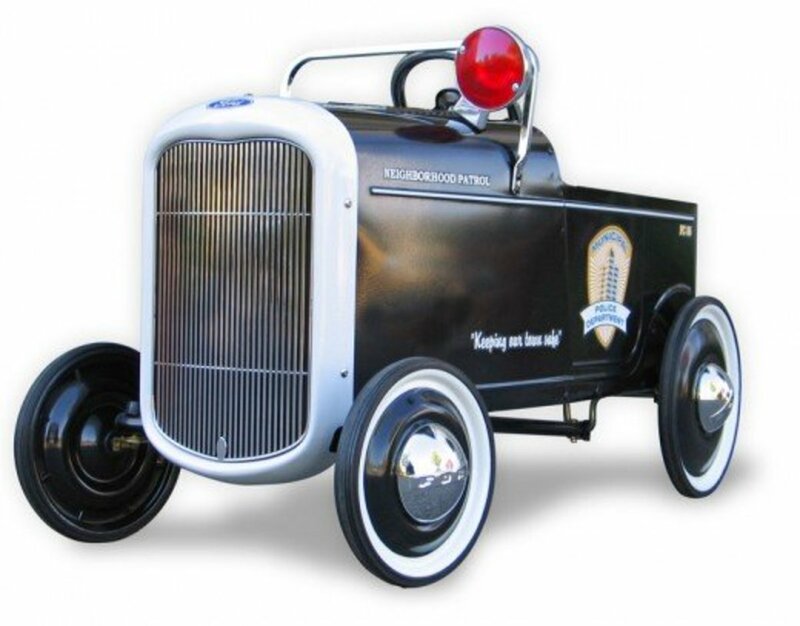 When the Model T was introduced, pedal car versions were brought out almost immediately and they featured a steel body molded to look like the real thing, and a wood chassis and wheels with rubber tires. Stevenson Bros, reproduction Rolls Royce Silver Shadow. For the first few decades of their manufacture, pedal cars were, unsurprisingly, quite expensive. Only the affluent could afford them, and although they had proven to be very popular, particularly during the 20s and 30s, production slowed significantly in the 1940s as a result of the need to redirect metal toward the war effort. In fact, from 1943 to 1945 there were no pedal cars made at all. The cars resurfaced again in the 1950s and 60s and the booming economy meant they could now be found in major department stores and large toy shops. 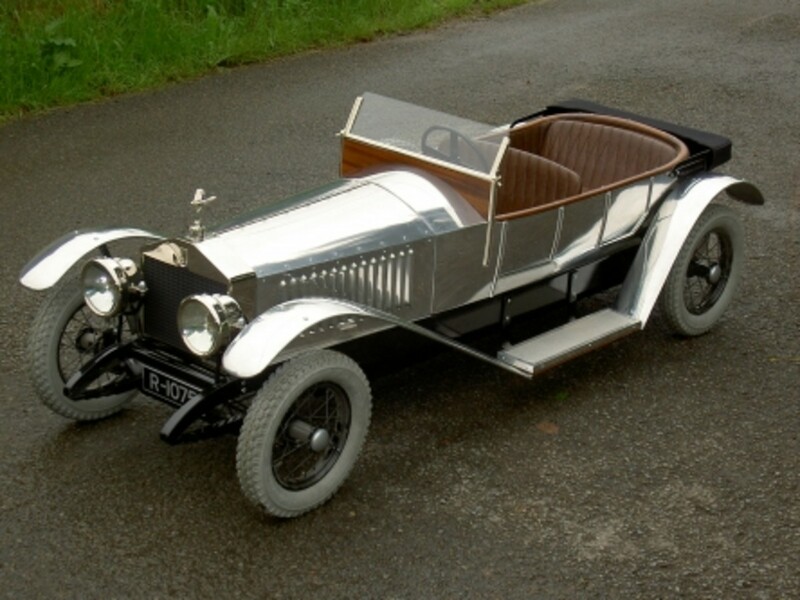 With wider sales came more elaborate features, and many of the chain-driven pedal cars from this era had workable parts such as lights and wipers, white-wall tyres, custom paint jobs, hood ornaments, movable windshields, and fancy chrome detailing. They were flash little numbers that were still fairly pricey but not unattainable. 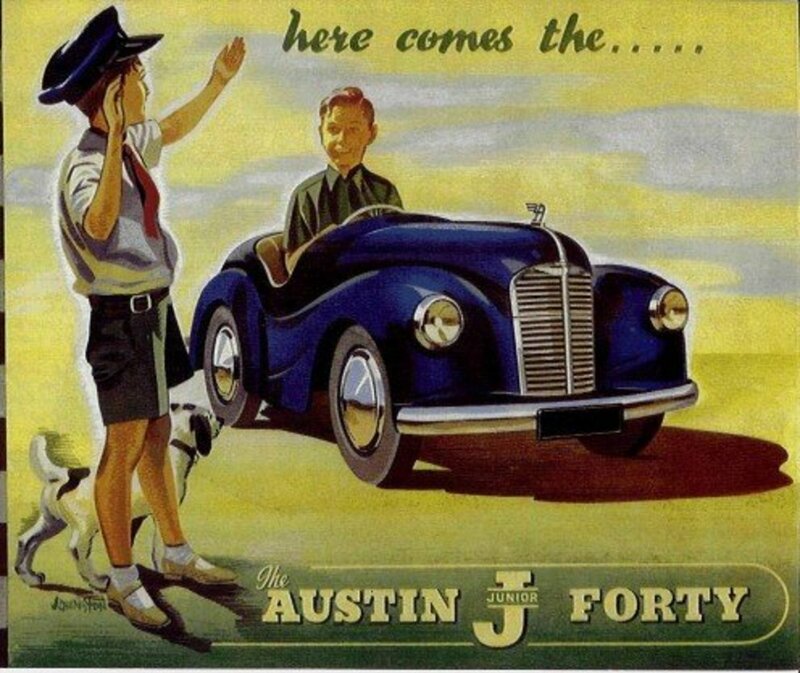 The British Junior Forty (J40), brought out by the Austin Motor Company in the 1950s, featured pressed steel fabrication, a dummy engine beneath the bonnet, electric lighting and horn, realistic dashboard details, pneumatic tyres, an opening boot, and chrome-plated brightwork. Nice. In America there was the Kidillac, a neato mini version of the Cadillac, as well as mini Chevys, Thunderbirds, Corvettes, and more. In Australia Cyclops Toys also manufactured pedal car versions of American cars. In the 1970s, quality took a dip and the vast majority of cars were made from plastic rather than metal. Not surprisingly, the plastic version failed to conjure the same authentic feel. The little cars no longer resembled real ones, so they faded from view for a while. In recent years, companies have emerged offering terrific quality cars that make an old pedal car fan salivate all over again...if you can afford it. Stevenson Brothers, who also make rocking horses, produce period pedal cars to die for, with leather seats and detailed dashboards. Their range includes Bentleighs, Rolls Royces, and Alpha Romeos (and the prices are commensurate). The vintage Rolls Royce Silver Shadow costs more than a real car! Pedal Car Planet has a snazzy range of not too expensive vintage reproduction cars and other nostalgia-inducing wheel based vintage toy object, including some lovely styles from the 50's, such as the little aqua number shown top right. Another absorbing place to shop for pedal cars is Speedway Motors. They sell both cars and parts (for those interested in doing the restoration themselves). Lordy. I might just sell my Grandmother for this one. 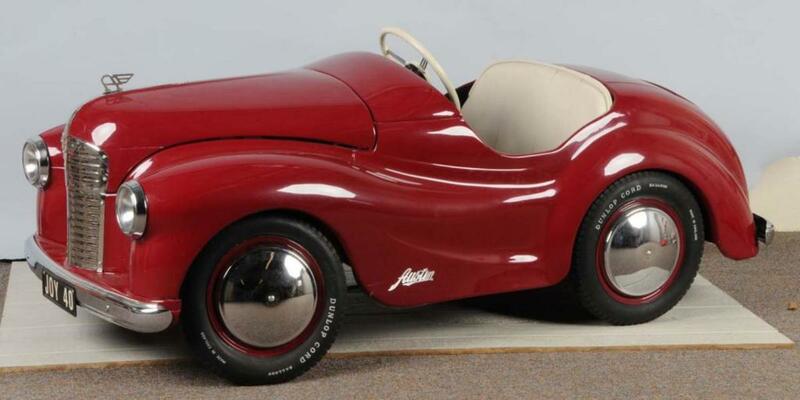 Austin Junior Forty (J40) pedal car. Needless to say, I'm not the only pedal car fan on the planet, and early models are very collectable. According to an article I read by a collector, in the the market has been very "up and down" over the last fifteen years. Which Cars Should Collectors Look For? The larger, pre-war pedal cars are, apparently, the most collectable, and some of these can fetch up to $15,000 at auction. Next in line are cars from the 1950s. Anything made after the 1960s is not particularly desirable as a collectable. Collectors and enthusiasts believe the 'realism' went out of the cars at that time (originally they were realistic copies of their parents cars, and they eventually became mere plastic shells). Kids today, of course, can buy electric motorized versions but there's something about the mechanical simplicity of a pedal car that appeals. Besides, the pedals are better for developing motor skills and for exercise. Found an Neiman marcus 1991 replica austin j40, in fiberglass. Anbody have any info? a pedal car is an old fashion but still i wish to had one.This remind me of my childhood years which was the most precious day of my life.My father gave me his ?????????????? ?????????? and i treasure it much. I bet they were Ruby! Thanks for reading. Great pedal car pictures. Loved the article. My grandparents had a number of them, they were really fun to ride around the country yard. speechless, But I like the hub. Susan, an adult sized rocking horse..how lovely! I'd have fun with that, but I guess it would be a bit intimidating for little kids...plus it would take up a lot of room. What a great thing for him to do though. Thanks for popping in. drbj..thanks. "A red Miata in Miama*..would make a good song! I think we called them MX5's over here...funky! Given the cost of fuel here in Aus. smaller cars really make sense. The downside is that you're not as safe in the event of a crash. Hi dahoglund...a second-hand pedal car is better than none at all! Thanks for dropping in. Rod, thanks. Pedal cars were only good up until a certain age and they weren't exactly a practical form of transport!...so I can understand you prefering your bike. I loved my bike too. That rolls is something else isn't it..? Merlin, I am imagining you riding around in a little army jeep. How cute. These are the classic nursery toys aren't they? Thanks for dropping in. I never owned a pedal car either, Jane, so I share your envious recollection. But when Mazda first came out with the small Miata back in '90, guess who owned the first red Miata in Miami. Yours truly! I literally loved that tiny car. It was stick drive with a fast start. I owned it for 3 years until a large sedan forced me off the expressway by veering into my lane to take an upcoming ramp. Didn't get hurt - I backed off the expressway. But traded it in for an SUV. Still love the Miata though. Thanks for reminding me with this excellently written hub. Voted up. I think for a while I might have had a pedal car, but it would have been second hand or a hand me down.I don't recall it ever working too well. I was never much interested in pedal cars when I was a kid. A Melvin Star push bike seemed more practical. I had one of those. But I think if someone made me a present of Silver Shadow rolls push car I might have had a change of heart. I remember there was a gangster movie once where all the actors were kids and they used push cars to get around. Then I suppose there are those classic sixties push cars used in the TV show Gilligan's Island. In the mid 1950's I had a US Army Jeep Peddal Car, can't remember what happened to it, when we moved south I can't remember it coming with me only my Bike ! In my Dust Bunny stories the Oomin girl Maggie and her dust bunny friends spend a lot of their time in an old nursery filled with the toys in your pictures. 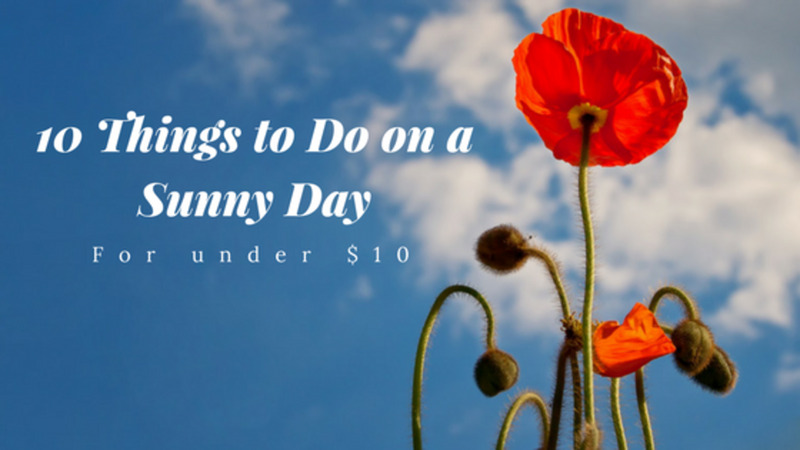 Not a Game Boy or Wii in sight ! Haha, thanks cahmilj...I'm just envious of all you people who had pedal cars. 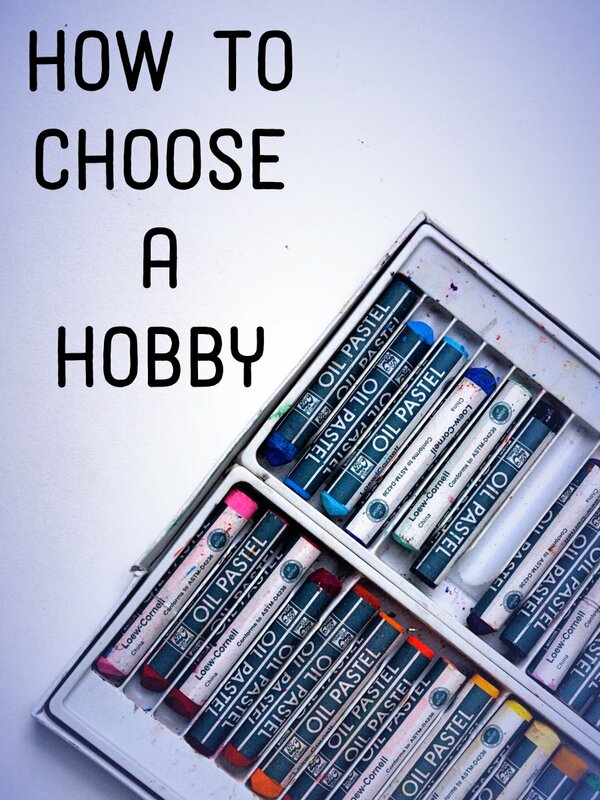 recommend, I love the J40 to bits..you lucky boy! Although, maybe not..it's a pity your memory of it is marred by that reckless incident. Your parents might have got rid of it, thinking it was 'too dangerous'. Brothers eh! Wow - I had one that (from memory) would be the Austin forty. My brother broke my collar bone for the second (of three times) by pushing me age 5 at top speed down a narrow bumpy path and into the trunk of a pear tree, I know the tree because I also suffered a fruit bump on the head. Never saw it again, it dissapeared between me going off to hospital and getting back home again. REally well researched excellent hub - marking it up!